Award-winning author China Miéville plunges us into the year the world was turned upside down Award-winning writer China Miéville has long been inspired by the ideals of the Russian Revolution and here, on the centenary of the revolution, he provides his own distinctive take on its history. In February 1917, in the midst of bloody war, Russia was still an autocratic monarchy: nine months later, it became the first socialist state in world history. How did this unimaginable transformation take place? How was a ravaged and backward country, swept up in a desperately unpopular war, rocked by not one but two revolutions? This is the story of the extraordinary months between those upheavals, in February and October, of the forces and individuals who made 1917 so epochal a year, of their intrigues, negotiations, conflicts and catastrophes. From familiar names like Lenin and Trotsky to their opponents Kornilov and Kerensky; from the byzantine squabbles of urban activists to the remotest villages of a sprawling empire; from the revolutionary railroad Sublime to the ciphers and static of coup by telegram; from grand sweep to forgotten detail. Historians have debated the revolution for a hundred years, its portents and possibilities: the mass of literature can be daunting. But here is a book for those new to the events, told not only in their historical import but in all their passion and drama and strangeness. Because as well as a political event of profound and ongoing consequence, Miéville reveals the Russian Revolution as a breathtaking story. 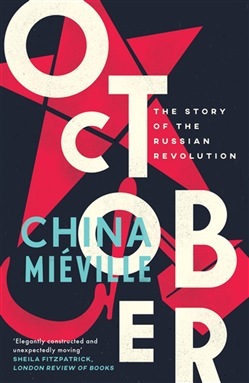 Acquista October in Epub: dopo aver letto l’ebook October di China Mieville ti invitiamo a lasciarci una Recensione qui sotto: sarà utile agli utenti che non abbiano ancora letto questo libro e che vogliano avere delle opinioni altrui. L’opinione su di un libro è molto soggettiva e per questo leggere eventuali recensioni negative non ci dovrà frenare dall’acquisto, anzi dovrà spingerci ad acquistare il libro in fretta per poter dire la nostra ed eventualmente smentire quanto commentato da altri, contribuendo ad arricchire più possibile i commenti e dare sempre più spunti di confronto al pubblico online.